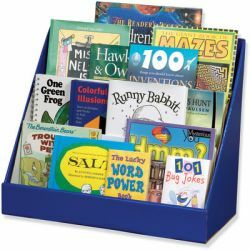 Classroom Keepers® is a line of sturdy corrugated boxes ideal for storing, protecting and organizing classroom material. A variety of box sizes and designs allows you to organize and arrange your own convenient storage system. Sturdy three tiered book shelf provides storage for books, DVDs, magazines and more. Large space in back holds oversized books. Glossy finish. Recycled and recyclable. 10" x 20" x 17".